A handbag as romantic as a serenade beneath your window. 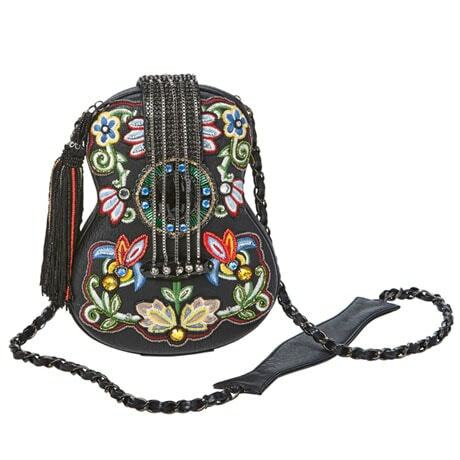 Adorned with beads, embroidery, chains, crystals, and a lavish beaded tassel, this extravagant bag will dress up anything you wear. Black faux leather is fully lined with red satin. Frame bag closes with magnetic snap. Beaded chain-woven cross-body strap has a 22" drop. Interior slip pocket fits a cell phone. From award-winning designer Mary Frances, whose bags are prized by collectors and celebrities including Oprah, Kate Hudson, and Jennifer Aniston. 6 ¾"w x 9"h x 2"d. Imported.